I laughed, I gasped, I blushed, and I could not stop smiling. What caused this wave of excitement you ask? The winter premiere of Once Upon a Time, of course! Earlier this week I had the pleasure of attending an advanced screening of “The Cricket Game” followed by a Q&A session with the show’s charming creators Edward Kitsis and Adam Horowitz. Prior to watching the episode, I asked the OUAT fans on Twitter if they had any questions for the second half of the season, and I received a swirl of enchanting tweets. We at Hollywood.com always want our readers to be heard, so I’ve paired your Twitter questions with answers from the producers and just like magic, your wish has been granted. Keep reading for all the mesmerizing details on Emma’s love life, Rumplestilskin’s search for his son, Charming family bonding, and much more! @Betsypaige24 We’re desperate to know if they actually care about Rumbelle. They never speak about them. Will we get ANY romance? Thanks! @LizzieMo will we [see] Emma tell her parents more about her past & childhood? We need more charming family bonding. 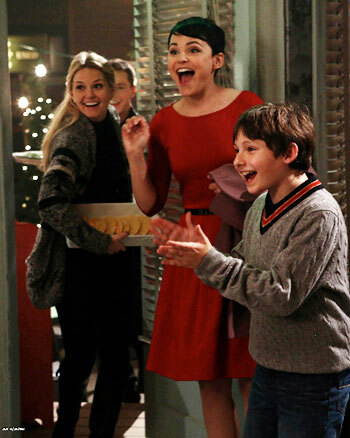 Funny you should mention that because family bonding is exactly what’s coming up for our Storybrooke royals. Now that Snow and Charming are finally reunited, we get to see a lot more family interactions — and some blush-inducing, giggle-worthy moments when Emma returns home a little earlier than expected. Kitsis explains, “It’s fun to see [Snow and Charming] together again and I think for us they are kind of figuring out their new role being together, being in Storybrooke, and being Emma’s parent’s even though they’re the same age.” Howowitz follows, “The first half of the season really was really like them coming to terms with the memories are back and all that. Now going forward it’s well what does all this mean being a family?” And to answer your question, we will see Emma in “The Cricket Game” briefly trying to explain her less than perfect past to her parents. @OnceWatcher Am I too late to throw something in the hat? Can you ask the creators if they know how many fans love Emma & Hook? Thanks. Oh trust me they know. I asked that exact question and was greeted with two big smiles from our all-knowing showrunners. Kitsis laughed, “Yes both for and against I’ve seen.” And to my surpise, Horowitz then asked me, “Which side are you on?” All of the sudden my professional journalistic behavior was gone and my inner fan-girl proudly announced, “Oh I’m all for it!” My mother would be so proud. @captainswans Please please please ask the OUaT producers about a possible Hook/Emma romance. We’re all dying to know! Thank you!!! Going off the same conversation, Kitsis was very light-hearted with his answer regarding a possible CaptainSwan connection. He joked, I think it’s hard to deny the handsomeness of Hook, and I think the real question is, is he going to loose the guy-liner in storybook? And the answer is no.” On a slightly more serious note, Kitsis explains that there are going to be quite a few men in her life this season. “Emma is going to find herself with a few choices this season and I think there are the people that are right for you, and there are the people that are wrong for, and then there are the people that you just choose and I think Emma is going to face all those things,” Kitsis said. As we all learned this year, wherever we see Aurora, we know that Mulan is always close by ready to protect the dainty princess. Fans will get a deeper peek into Mulan’s past in “The Outsider” airing Jan. 13. Kistis said, “Aurora and Mulan are off to save Phillip and we are hoping to kind of return to that at some point this year, but I can say that for the first batch of episodes we are focusing on the Charmings and the Rumbelles and it’s family dynamics. That’s what really is going on.” So be prepared Aurora fans, because after Jan. 13 we wont be seeing this fearless feminine duo until we near the end of season two. Bonus Scoop: Are we going to see Ariel anytime soon? Diehard fans of the show know that the idea of Ariel has been teased on nurmerous occasions, so I made sure to ask what’s the plan for our favorite underwater princess. Kitsis explained, “Probably not this season, we’ve taken a lot of toys off the shelf and we’re probably not going to see her this year . We do have a plan for her if there is a season three.” If? No, more like when! Horowitz added, “Ariel’s character is a character that we love and in our minds we have a way that we want to integrate her into the story and we don’t want to overload with too many [characters].” Fair enough, but I seriously cannot wait for the day that we finally get to see her swimming our way. Can’t get enough Once Upon a Time? Of course not! Check back to Hollywood.com tomorrow for a magical article to get you all caught up before Sunday night’s winter premiere! What are you most looking forward to seeing from Once Upon a Time this year? Which couple is your favorite to ship? Are you overwhelmed by all the bewitching scoop? Cast your spell in the comments below! 20 Hottest Bikini Bodies of 2012: Katy Perry, Miley and More!